In the 1930s, when it was known as the Edinburgh Astronomical Association, John Henry Lorimer, a well-known artist and brother of the famous architect Sir Robert Lorimer, was Vice-President. 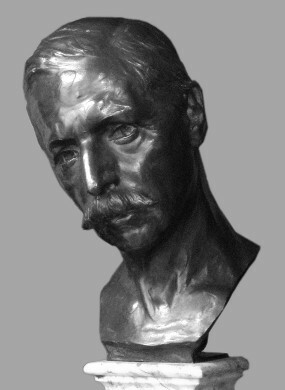 He died in 1936 and left a substantial legacy to the Society: We own a bust of Mr Lorimer and two of his paintings. Some of the funds were used to endow a medal in his honour, to be awarded at the discretion of the Council, to persons who have made notable contributions to popular astronomy. It is not awarded often, and not given lightly. A number of Lorimer’s paintings can be viewed in the BBC’s Your Paintings collection. The Society still owns Sunlight in the South Room, Kellie and The long shadows, which are on display at the National Trust for Scotland, Kellie Castle, Fife.